Huddled in the doorway sheltering from the rain a friend and I joined the queue to visit the mathematical society. Well he is a mathematician so has an interest and I figured the queue wouldn't be one of the longest for open house day. I'm not going to confess as to how long we ALL were there before it was apparent we were at the wrong entrance. However I want to know how many of you know what this machine is AND of those how many know how to work it! My friend did! The bonus was the library. Do you know how to resolve the "functions of a complex variable"? Thought so. Reminds me of comptometers that once filled offices. How much better is a spreadsheet! I reminds me of the Enigma machine! Interesting piece of kit!! I sort of remember working one of these & pulling down a handle, too long ago! Well it looks like a complex adding machine but, I'm betting it's something more...well...complex. Whatever it is, I sure can't work it. Nor do I know what functions of a complex variable are, but I have lived a pretty good life so far without knowing it. I used one of these in a 7th form statistics class. Turning the handle until the bell rings then moving along one numeric position, more grinding until the bell rings .....Bloody annoying when you turned too quickly and missed the bell. Am I getting old? Comptometer was what came to my mind, too - not that I've ever used one. A friend left school to become a comptometer operator . . .
Looks like the Enigma machine. Hmmm. Functions of a complex variable are pretty much why I failed maths at university level. 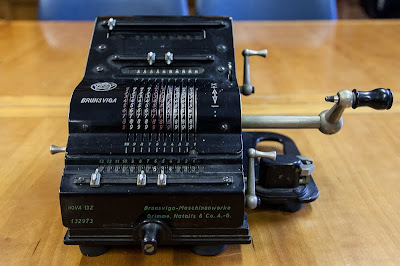 They used to use counting machines like that in South African banks until the early 80s! I remember my mum cashing up on one.